These are super easy to make and bursting with flavor!!! Pair these sliders a salad and a glass of wine for an easy, healthy and delicious dinner. Slice Eggplant into rounds (3-4 to 1 inch thick). Salt the eggplant for 30-40 mins to remove excess moisture and bitterness. Brush Eggplant with olive oil. Sprinkle with garlic salt & parsley. Slice half of the bell pepper & dice the other half. Add diced sun-dried tomatoes, bell pepper & garlic to ground turkey. Cook eggplant on each side for 4-5 mins. 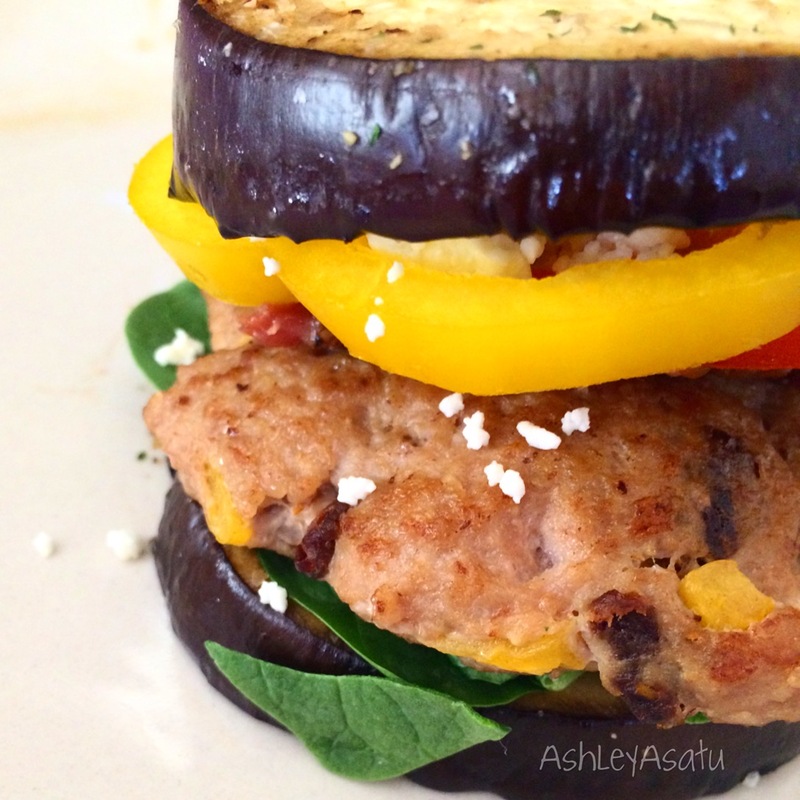 Now pile spinach, turkey, bacon, tomato, bell pepper and feta in between two slices of eggplant and eat!! These are also kid tested & approved! P.S. I didn’t measure anything out so get creative and let me know how it turns out!! Add sliced eggplant into a bowl or shallow dish. Sprinkle with salt and let stand for at least 30 mins. Rinse eggplant and blot dry.